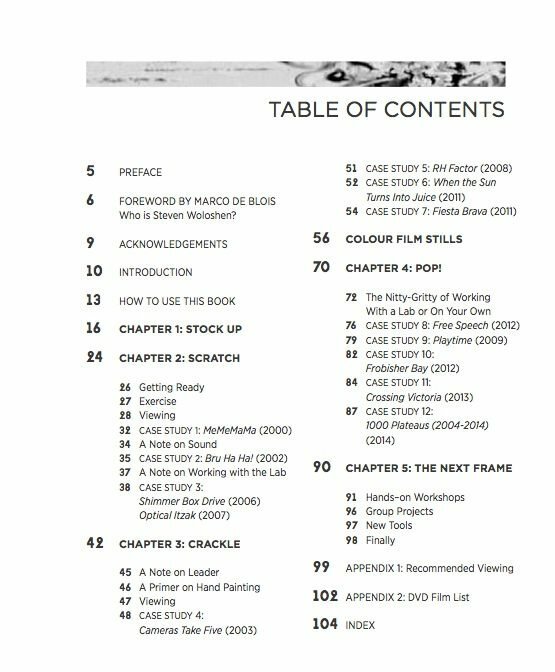 Plunge into the visceral, energetic world of handmade filmmaking with this unique, easy-to-read manual. Award-winning animator and filmmaker Steven Woloshen guides you step-by-step through the process of creating handmade films using simple, everyday tools. Here, Woloshen shares the knowledge and experience he has acquired over his 30+ years’ experience of making short, abstract films. 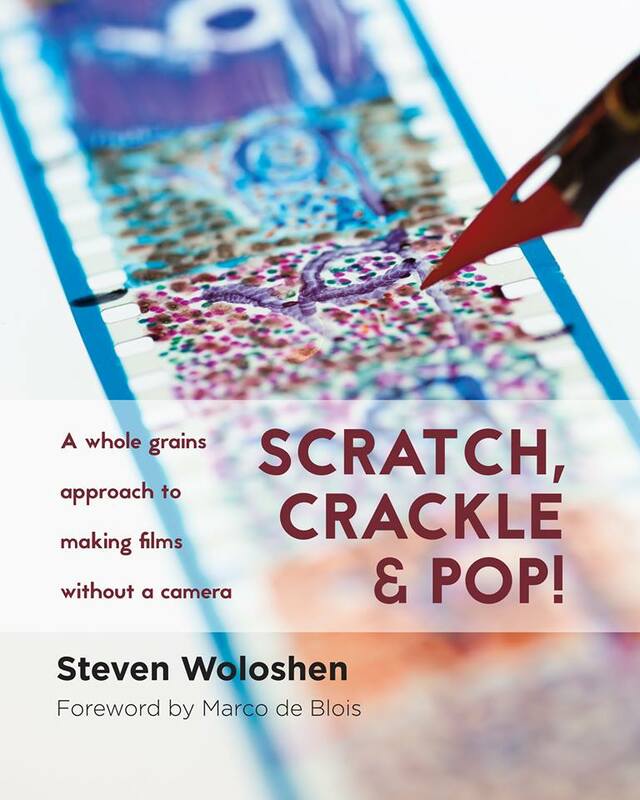 Written for aspiring animators and film lovers alike, Scratch, Crackle & Pop! is a one-of-a-kind guidebook that explores the techniques, processes and tools of the trade through in-depth case studies of thirteen of Woloshen’s best-known films. A companion DVD and 35 mm film strips are included. As I spent more time presenting my films at workshops, master classes and retrospectives, I fielded an ever-increasing amount of questions from my peers concerning the technique of painting and scratching on film. I created a book to make these processes available to artists, students, teachers and the general public. Publishing a “manual” of handmade animation film techniques titled, Scratch, Crackle & Pop: A whole grains approach to making films without a camera. It highlights 30 years of aesthetic discoveries that I have made in super–8, 16 mm and 35 mm animated/experimental film production. To enrich the reader’s understanding of my process, I also enclosed a DVD compilation of short films that I have created between 1982 and 2011. There exist a very limited number of books on handmade film. There are even fewer practical “guidebooks” on the subject of handmade film techniques. In 2010, I decided to self-publish my first filmmaking cookbook, Recipes For Reconstruction: The Cookbook for the Frugal Filmmaker. This do-it-yourself manual not only helped me promote my visibility in the field of cameraless filmmaking, it also reminded me how few artist books exist to inspire experimental filmmakers. This second instructional book is intended to convince developing artists to try simple, inexpensive handmade filmmaking before it becomes extinct. To many people who may only know the name of Norman McLaren, this book of will introduce established international names such as Len Lye from New Zealand, Harry Smith from The United States as well as Barber Neubauer and Pierre Hebert – and new techniques such as batiking and bleaching directly onto the surface of the film. This book will also help me to cross language barriers and talk at greater length about my processes to an international audience. Scratch, Crackle & Pop is divided into three distinctive sections. Each part will highlight the qualities and characteristics of a particular technique that I’ve used in my process (i.e. scratching, painting and brikolage) and will include a list the tools and tips for creating a successful film. Hand–drawn diagrams, film stills and photographs will also be added to support the physical production steps. Each chapter will also reference the films on the accompanying DVD. Mr. Marco DeBlois, the animation curator from the Cinematheque Quebecoise has graciously agreed both curate and edit the book for historical accuracy. As guest writer and curator, Mr. DeBlois’ chief responsibilities will ensure that the book provides a focused attention on the methodology of hand made filmmaking – a style of filmmaking where Quebec is has become a historical Mecca. Why don't more books like this exist??? I am the proud owner of Woloshen's first book, Recipes for Reconstruction, and I can't wait to get my hands on this one! The first book is so practical and fun to read... full of great information and tips. The bonus DVD is a real treat. This new book explores the techniques I am really interested in trying, scratching and painting on film! I can't wait!! !